How do I get disability for PTSD secondary hypertension related to my time in the service? Post-traumatic stress disorder (PTSD) is a mental health condition that can occur after someone witnesses or experiences a life-threatening, traumatic, or terrifying event. Veterans who suffer from service-connected PTSD may also suffer from secondary medical conditions, including hypertension, also known as high blood pressure. Untreated, high blood pressure can lead to vision loss, kidney and heart disease, and stroke. According to research cited by the American Heart Association, soldiers in the U.S. military who were severely injured during the Afghanistan or Iraq wars or diagnosed with PTSD are at a greater risk of suffering from high blood pressure. Additionally, researchers have found that soldiers who suffered from PTSD were up to 85 percent more likely to develop high blood pressure than those who didn't have PTSD. The more severely injured the soldier, the more likely she was to have hypertension. The United States Department of Veterans Affairs (VA) recognizes hypertension as a ratable illness, and you may be eligible for disability benefits if you suffer from this as a secondary condition. 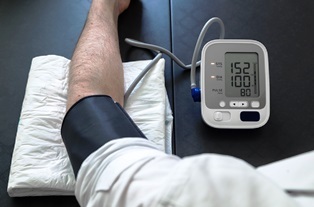 If you can prove your hypertension is related to your service-connected PTSD, contact an experienced VA disability lawyer to help file your claim for compensation. To receive a disability rating for PTSD secondary hypertension, your doctor needs to document your diagnosis of high blood pressure. Additionally, to file your claim, your doctor needs to fill out the Hypertension Disability Benefits Questionnaire. It’s important to note that you can’t fill out this form yourself—the VA won’t accept the form submitted by a veteran. It must come from a licensed physician. A detailed medical history about your condition, your symptoms, and any other relevant information that affect the decision by the VA.
A professional opinion about how your hypertension impacts your ability to perform on the job. The claims examiner reviews this information and assigns a disability rating for your high blood pressure. If you’re a veteran suffering from hypertension due to PTSD and would like to submit an application for hypertension as a secondary condition, call Cuddigan Law. Our attorneys will examine your case, develop the best strategy, and work with you to submit a claim that increases your chances of receiving disability benefits. Contact our office today.